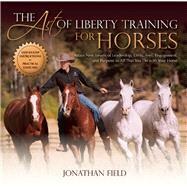 Horse trainer Jonathan Field has made a name for himself with his unique ability to give people simple, understandable, doable steps that lead to working with a horse at liberty” in a safe and progressive manner. True engagement with a horse at liberty isn’t just about removing tack and stepping outside the arenait’s about connection, trust, and communication through movement. Enrich your relationship with your horse, improve your feel,” and teach your horse to respond to the subtlest of cues; no matter your discipline, whether you compete or ride for pleasure, liberty training can change the way you interact with horses forever. Jonathan Field has studied closely with a number of top instructors, learning their methods, listening to their ideas including Pat Parelli, Ronnie Willis, Craig Johnson, Ray Hunt, Dr. R.M. Miller and George Morris, to name a few. Jonathan's success is not a surprise when you consider the gracious help, time and experience so many wise and talented horseman have personally shared with him. This willingness to share knowledge has sparked Jonathan to go the extra mile to help a student or a troubled horse, sometimes late into the evening at a clinic. He'll say the best way to repay your teachers is by passing it on to others. Jonathan has since started hundreds of horses; trailer loaded thousands, including wild and problem horses; and has developed his own horses into the best friends and partners that you see in his demonstrations. He has coached, mentored and shared his knowledge with thousands of people in clinics and presentations. Jonathan's been the crowd favorite at the Mane Event in both Red Deer and Chilliwack in British Columbia since 2004, and he headlined the 2008, 2010 and 2011 Western States Horse Expo in Sacramento, California. He also attracted a record number of horse enthusiasts at the 2009 Western Canada Farm Progress Show in Regina, Saskatchewan. Jonathan recently shot a pilot for a television series that promises to bring his message to even more horse lovers around the world.